Originally published on 10th August 2012 on Dave’s personal blog. I have a cheap Harley Benton JBass, a JB20 – currently £75.20 from Thomann in Germany. That’s very cheap, and you don’t expect too much. Out of the box, I’d describe it as OK, and attractive enough, not great, but OK. One good point is that it seems to stay ruthlessly in tune. This is probably due to the bodywork, which is solid wood, and not MDF or plywood that you often get in cheap guitars. I since bought another bass, which is my main one now, and, due to my rather soft skin, I restrung it with Nylon covered strings. It sounds great, but very smooth, and doesn’t have that “twang” that you need with songs like “Substitute”. So I thought I’d try something on the JB20: a set of traditional medium weight Rotosound roundwound strings. These were all the craze in the 60s, John Entwistle being a user. These, coupled with the very solid bodywork of the HB, resulted in a major transformation! Even before plugging the bass into an amp, I could hear the difference, though the strings did not look or feel all that different, but I got an audible twang replacing the dead sound of the unamplified original strings. I tuned the strings using an online site called tunemybass, gave them a week to stretch and tuned them again. Since then it’s stayed in its bag for a few weeks, but last night at practice I decided to put it to the test, and used it for Substitute and When You’re Young, with a pick. Wow! It won’t work for the majority of songs, but for those it made all the difference, bringing them to life. Oh, and hadn’t wandered out of tune, not even slightly. Teamed up with a Behringer BDI-21 bass pedal (it seems to correct impedance problems even when not switched in) and noisefree leads (Boston Braided Pro), I’ve got a great “60s Beat sound”, which complements the other bass, a customised Fender Squier, which sounds really smooth. So if (when, I hope!) 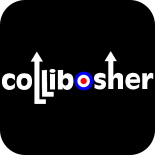 you come to see Collibosher play, if you see me swapping basses between songs, I’m not being a pretentious git. It really does make a difference!